But how will Twitch react? Plays.tv, an Instagram-for-gamers-esque video service, wants to make it easy for users to capture highlights from the live streams on your favorite Twitch channels. 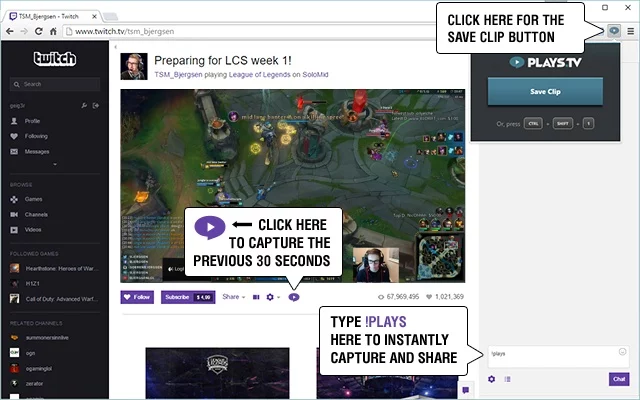 The company just released a new Chrome extension that will help you do just that—but those clips will appear on the Plays.tv website, not Twitch itself. The extension allows anyone to grab 30-second highlight clips from Twitch and save them as public clips on Plays.tv. The extension can capture highlights from any Twitch broadcast at source quality. Although anyone can grab a clip from Twitch, ultimate control of the video on Plays.tv remains with the Twitch broadcaster. Whenever you grab a clip from Twitch, the Plays.tv extension stores it on its site under the Twitch broadcaster’s name. If the Twitch player is already connected to Plays.tv through their Twitch ID the clip joins their profile under the “Stream Highlights” tab. If they’re not on Plays.tv, the site automatically creates a new profile page for them—a profile that only they can claim by signing into the site with their Twitch ID. Once the clip is on Plays.tv users can share it to Facebook, Reddit, Tumblr, or Twitter. Anyone following that Twitch broadcaster on Plays.tv will also see the new highlight in their feed. The story behind the story: Plays.tv says it decided to create this extension after pro gamers asked for a tool to organize their highlights in a single place. But Plays.tv created this tool independent of Twitch, which raises the question of how Twitch will react. As the most popular broadcast gaming site, Twitch may not mind as the service appears to clearly benefit users. Then again, Twitch may not be too friendly to the notion of the competition grabbing content from their site and then setting up profile pages for their streamers, though Plays.tv says it's working on a way to compensate Twitch streamers for these user-created clips. 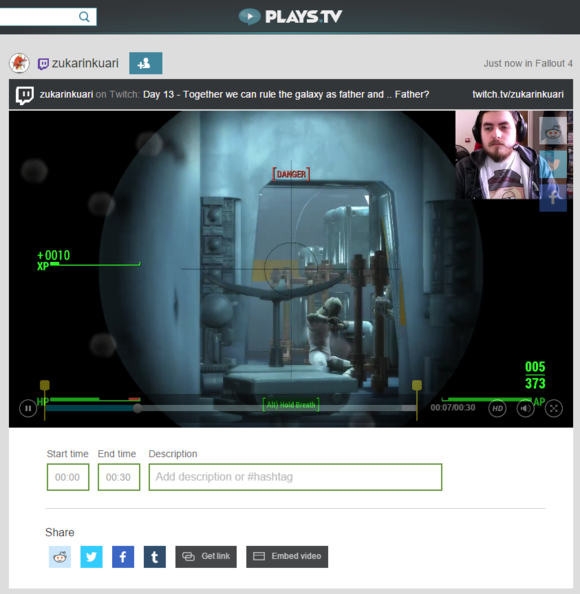 How to use the Plays.tv Chrome extension while you're watching a Twitch stream. The extension itself is very easy to use, as illustrated in the image above. All you do is click on the extension icon and select the Save Clip button. Then the last 30-seconds of gameplay you were viewing automatically gets sent over to Plays.tv—ready for sharing in just a few seconds. Once the clip is on Plays.tv, you have the option of specifying the start and end time as well as adding a description. If hotkeys are your thing, you can also grab content by tapping Ctrl + Shift + 1, or by typing “!plays” into Twitch chat. You don’t need to have a Plays.tv account to use the extension. If you do have an account, however, your Plays.tv user name will be attached to any clips you save using the extension.